Mastering email marketing is absolutely paramount when it comes to finding success in ecommerce. Your email list - which you should always be looking to build - is made up of potential customers who you know are already interested in your brand and products. But it isn’t always easy to write and create emails for your ecommerce business. In this article, I’ll break down 10 amazing ecommerce email templates from some of the best, including Starbucks, Adidas, Aritzia and more. We’ll look at each element of these templates to see what makes them so great, with takeaways that you can use for your own ecommerce email marketing. Wishpond's email marketing suite features templates that make creating ecommerce newsletters easy. Start turning subscribers into sales now. The ecommerce email template Aritzia uses for its sales promotion newsletters is an amazing way to showcase multiple products in a concise, easy to follow format. It’s conversion-focused and allows readers to get a quick glance at multiple products, including prices and images. Top bar CTA: Having a “Shop Sale” button right at the top of your ecommerce email template (above any of the body content) means people have a way to get to your site right away, if they’ve been captivated by your subject line. Big, bold hero section: Like a landing page, this email features a large hero section that conveys the email’s main benefit (“30-60% off”) and provides, again, a CTA that people can click to go straight to your store page. Product grid: Sometimes, simple is best. A product grid is a great way to show off multiple products in a relatively small space. This one is great in particular because it gives subscribers a product photo, the product’s name, and shows the sale price (and the original price). Links to individual products: Another thing having a product grid allows you to do is link to individual products - people are likely to click on the image they’re interested in, and linking to specific product pages (or even a category page featuring all of the products in your email) can put readers right where they want to be. 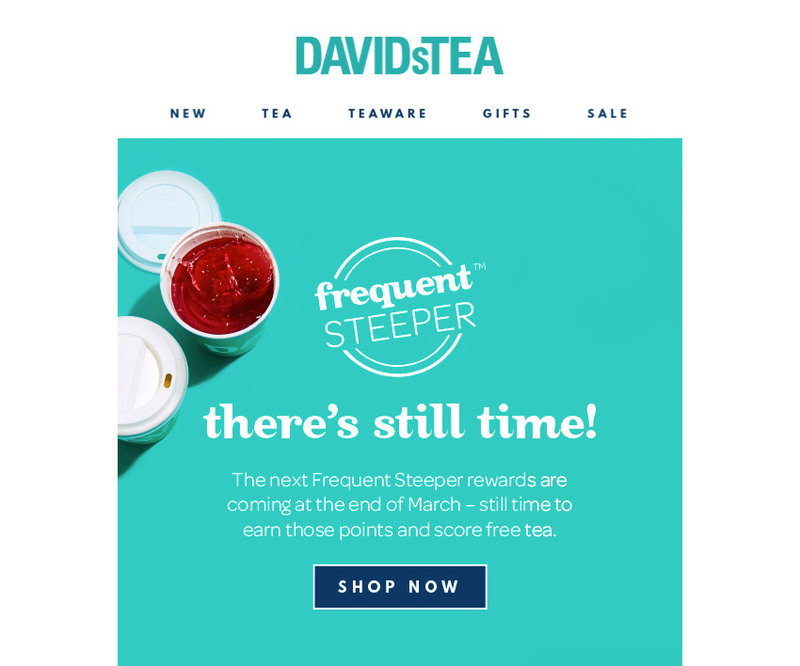 This is an ecommerce email template that DAVIDsTEA uses for their “Frequent Steeper” members. This particular email is a reminder that they still have time to earn rewards points before the end of the month. It’s short, simple, and to the point - and it looks great! Let’s dive in a bit deeper and see what makes it so great. The pseudo-navbar: Using the top portion of your email to display a few of your product categories can be a good way to get people to shop. Online shoppers are conditioned to use the navbar of their favorite online stores to navigate products, making it a familiar experience. The email’s short length: We’ll see in a few of the other examples in this post that ecommerce email templates can get really, really long. Keeping this ecommerce email template short and sweet makes the information it conveys that much more impactful. The design: Using eye-catching, full-width imagery to build your email is a great way to spice up an otherwise not-so-exciting medium. Using unique imagery in the email allows you to show off your products in a different way. Two different benefit headlines: The two main CTAs in this email are the same (“Shop Now”), but the headlines they’re attached to are different. Having two different benefits linked to your calls-to-action can help maximize the number of people who click through on your emails - if they’re not excited about the first benefit, they might be about the second. 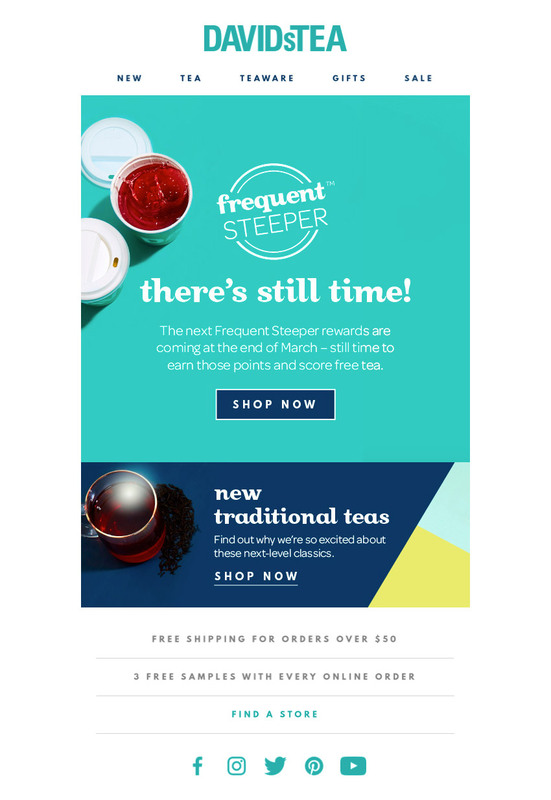 Point-form benefits: I love that DAVIDsTEA ends the email with a few benefits from their online store (in their case, free shipping on orders above $50 and 3 free samples with every order). The footer is a great place to let your customers know of any specific advantage there are to ordering from your ecommerce store. I’m a huge fan of Starbucks’ email marketing (seriously, I’ve written a whole article about it)... so we’re going to look at two Starbucks ecommerce email templates in this article. If you’re a Starbucks card owner, you’ll be familiar with this email, or emails like it. 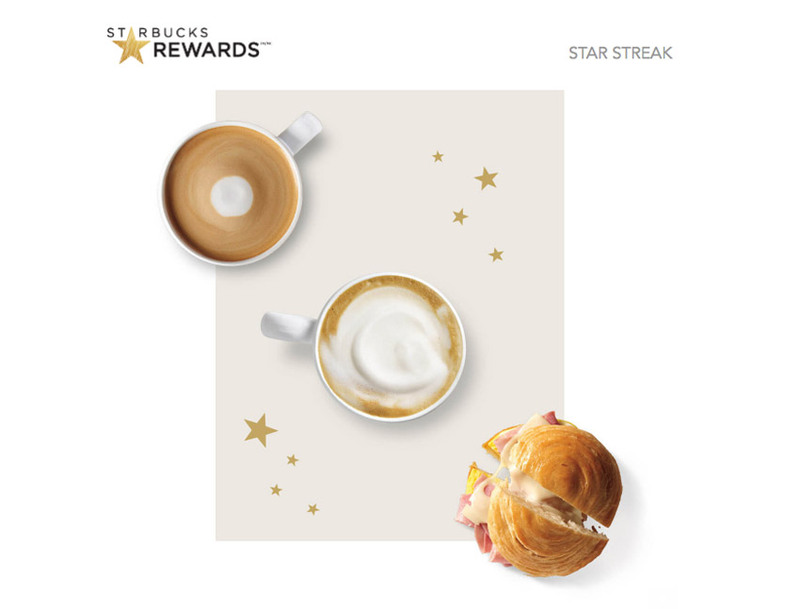 Starbucks is relentless in their email marketing when it comes to their rewards program, and with good reason - it makes them a ton of money. Their emails are simple, aesthetically pleasing, and about as optimized as it gets for ecommerce rewards. The benefit: Buying the items in this email gives the reader 125 bonus stars towards their next free Starbucks item. Offering an incentive for rewards program members in your emails can help increase conversion rates. The personalization: Though this might look like any other standard email newsletter, Starbucks has actually chosen the three items in this email based on my past purchases. Doing this further maximizes the chances I’ll complete their “challenge”. You can do this by using merge tags to fill in specific bits of info about your subscribers. The seasonal discount: Sure, random sales are great - but promotions are often more effective when they’re tied to a specific event, season, or occasion like Black Friday or Boxing Day. 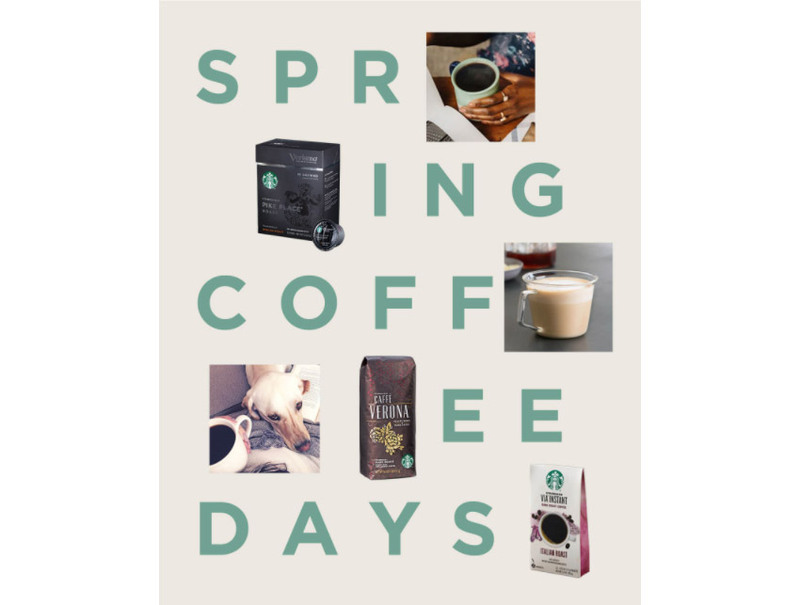 Starbucks has tied this specific discount to spring, giving it a more cohesive theme than it would have had otherwise. Content variety: This email is more than a sales announcement (which some might argue is a surefire way to reduce conversion rates, but when you’re Starbucks…). It features some short-form content teaching subscribers how to brew Starbucks coffee, and even a link to a video outlining how to use Starbucks’ Verismo machine. This type of content is engaging and informative, making people more likely to click on emails in the future. This is a cool email because it isn’t the typical product or sales promotion - instead, it’s an announcement for a partnered giveaway. Running a contest is one of the best ways to get new customers for your business, and this email does an awesome job at announcing it. The email length: Your giveaway announcement doesn’t need to be extensive. Remember that your subscribers still need to land on a giveaway page, and then be convinced to convert on that, too. Keeping your announcement email short keeps your readers’ eyes on the prize (somewhat literally). The design: This ecommerce email template is comprised almost entirely of images. If you’re a designer (or you have one on your team), using images to build your email allows you to kind of circumvent a lot of the limitations that emails have, like not allowing custom fonts and styling. The large, benefit-oriented headline: This email trumpets its main benefit loud and clear using a large, bold headline. People get so many emails nowadays that you’d be remiss not to cater to skimmers. A skimmer can read just the headline and understand what this email is about. A list of prizes: The most important part of any giveaway is the prize - it’s the only reason people enter, really. 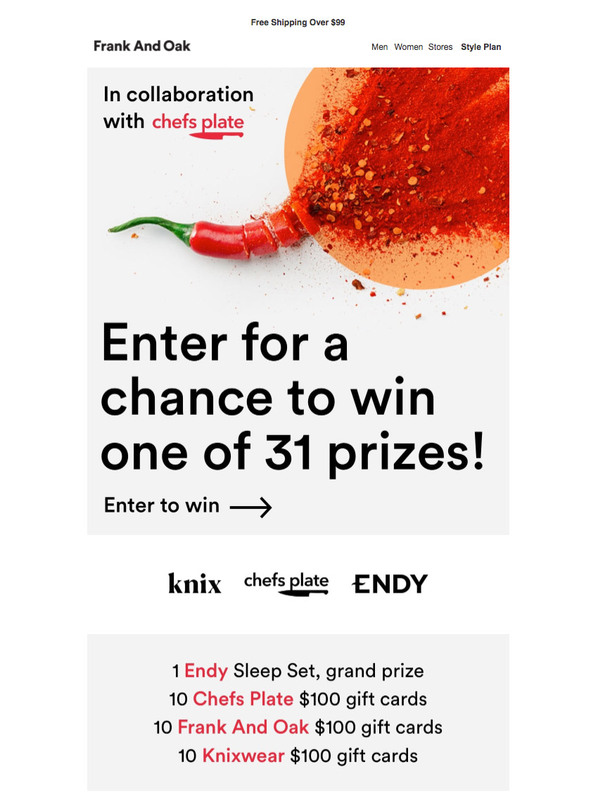 So it makes sense that putting your prize (or prizes) front and center will increase the clickthrough rate of your giveaway announcement emails. Though this is a pretty straightforward promotional email, I like the direction this ecommerce email template takes. 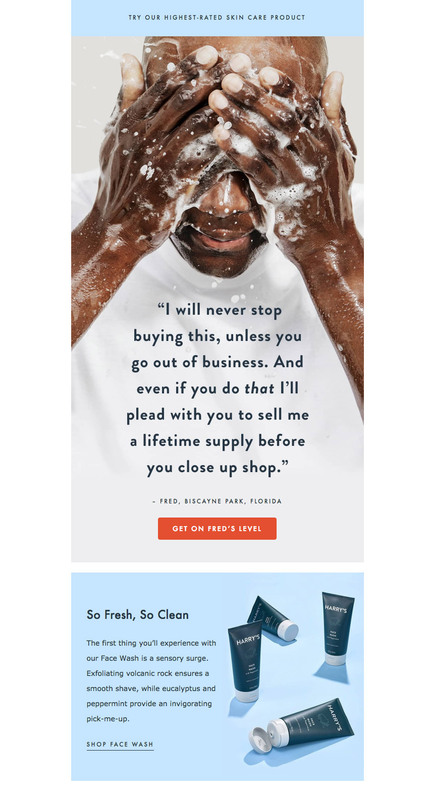 Instead of focusing on the product itself, Harry’s uses a testimonial from a satisfied user in this email template to market their face wash. The top bar: Before we get to the main event, let’s check out the top bar. Harry’s top bar acts as a preheader (the text after the subject line in your subscribers’ inboxes) and acts as a subtle CTA related to the content below it. The testimonial: This is the meat and potatoes of this email. Harry’s presents a compelling testimonial from a (presumably) real customer that acts as social proof for your subscribers. It’s reassuring for people to see that there are people like them who enjoy a specific product, making them more likely to buy it themselves. The related CTA: Normally, “Buy Now” or “Shop ____” makes the most sense. But this CTA relates directly to the testimonial above it, making it a little more exciting and feel less “same-y” when compared to other ecommerce companies. The secondary CTA: I mentioned this earlier as well, but having a secondary CTA for the same product can help “catch” those who didn’t convert on the first part of the email. I particularly like that this CTA provides a bit more detail on the product itself, which helps back up the testimonial, too. The page it links to: Though I know this isn’t really part of the ecommerce email template itself, I want to highlight the importance of linking your emails to a conversion-focused page on your website. Harry’s product pages are designed like landing pages - they’re beautiful and do an amazing job at detailing each product. Wishpond makes it easy to send ecommerce email newsletters, create email marketing drip campaigns, and segment your mailing list to turn your subscribers into sales. The pseudo-navbar: As I mentioned earlier in this article, you can add a pseudo-navbar to your ecommerce email templates to help get subscribers into a shopping state of mind. A clear value proposition: Your welcome email is your chance to make a first impression on your subscribers’ inboxes. MVMT does a great job here by summarizing their mission statement: “We believe style shouldn’t break the bank”. Links to shop: Don’t hesitate to push your subscribers towards product pages immediately - they know what they signed up for. 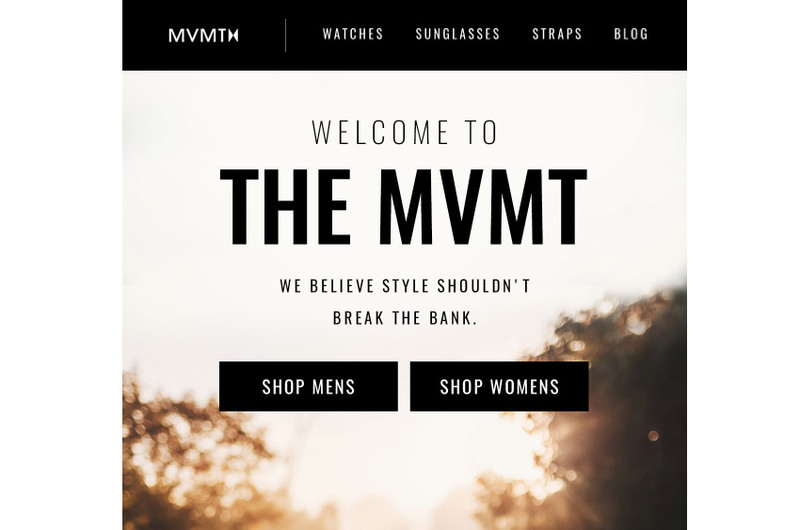 I like that MVMT has two separate links for both men’s and women’s products - I’m willing to bet they segment users into lists based on the link they click, changing the content they get in the future. The footer: MVMT ends off their email with a footer, much like the one you’d find on their website. It makes it simple for people to directly access product category pages and other content (like their Instagram and blog). 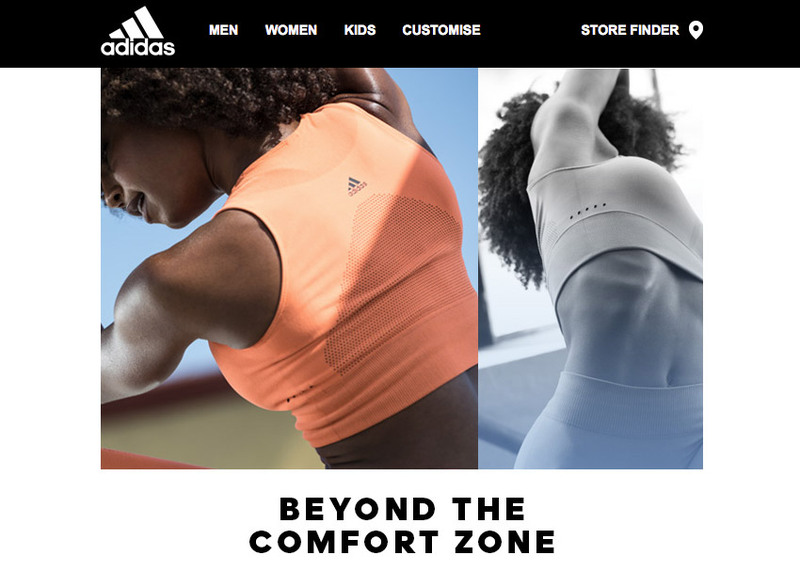 Like most other big brands, Adidas has it down pat when it comes to email marketing. This is an awesome example of a simple product email for a specific segment of their mailing list that features a couple of cool elements that you can steal for your own emails. The copy: The hero section alone achieves several goals: it introduces Adidas’ climacool technology, stresses how comfortable it is, and explains a few features of the clothing line’s apparel. The copy is simple, engaging, and informative. Segmentation: Adidas uses the information it has about its customers intelligently - this email, for examples, was sent only to women on its mailing list. Segmenting your lists and personalizing your newsletters is key to finding success with email marketing. The influencer testimonial: Adidas understands the power of social proof - and a testimonial from Victoria’s Secret model Karlie Kloss isn’t a bad place to start. You can bet people reading Adidas’ newsletter look up to her, and adding a space for testimonials from important industry figures in their ecommerce email templates can do wonders for conversion. The branded hashtags: When your customers are as engaged as Adidas’ are, creating branded hashtags is a great way to spread the word about your products on social. This ecommerce email template from RYU is a prime example of a great product launch email. It looks great, is on brand, and does a wonderful job at highlighting the main features and benefits of their new products. Let’s take a look at it from top to bottom. 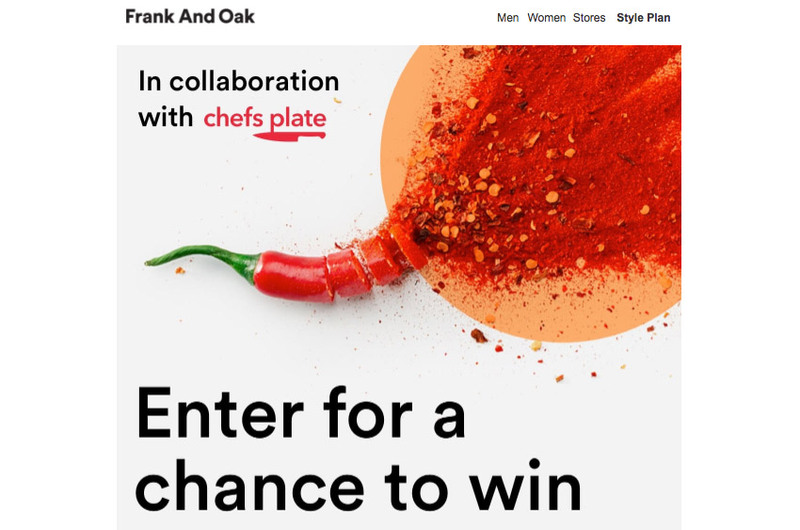 The contest announcement top bar and footer: Though this email is a new product announcement, RYU uses the top bar of this ecommerce email template to alert subscribers of a giveaway they’re running. Doing this again in the email footer introduces a strong secondary CTA that might capture people who don’t convert on the primary CTAs. The features/benefits list: When introducing a new product, it’s important to effectively communicate its features and benefits to potential customers. Doing this in your announcement email helps generate interest in your subscriber list, which leads to clickthroughs. I like that RYU picks their top 3 for each product and puts them into point-form - this keeps the copy short and skimmable. 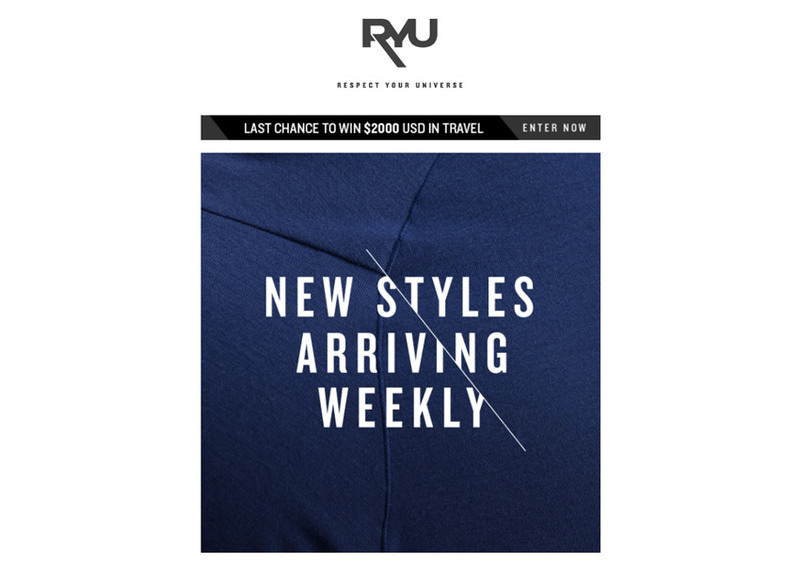 There’s something for multiple segments: Because this email wasn't sent to a segmented portion of their list, RYU has made sure to include a new men’s product as well as a new women’s product in this email. This ensures 50% of their list doesn’t find this email irrelevant right off the bat. ”You might also like…” Chances are, the new products you introduce in your announcement emails won’t excite everyone on your list. Adding a section to your email that highlights a few of your other offerings can help to draw in potential customers who weren’t enticed by the email’s primary products. Though this email is a bit long, there are quite a few things to take from it. This email is a sale-based email, and does a great job of highlighting multiple promotions, including a coupon code and clearance sale. The preheader: Though your subject line is still the main decider on whether or not people people will read your email, the text that comes right after it (the message preview) can play a large part in this process, too. 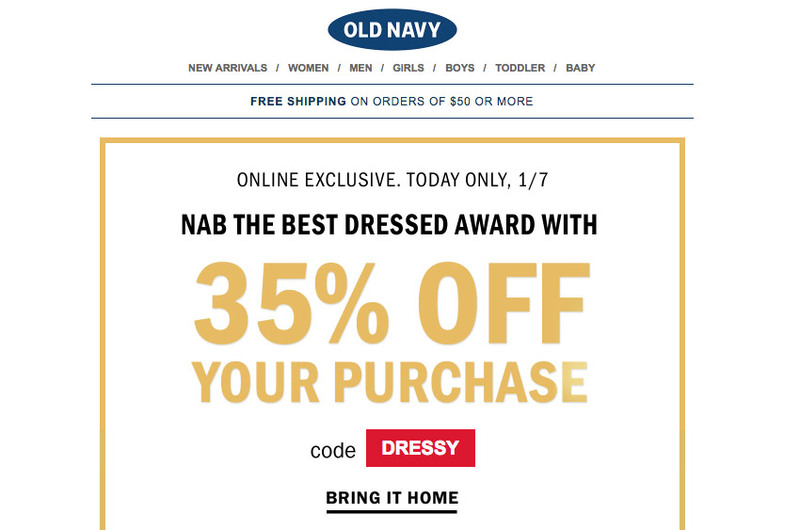 Old Navy uses preheader text in their ecommerce email template (“You’ve won! Up to 75% OFF clearance.”) to control what subscribers see in their inbox. The coupon code: Coupon codes are one of the best ways to turn your subscribers into sales - they help to push readers into action so they come to your store and buy. Adding a limited time-frame to the coupon (“TODAY ONLY, 1/7”) creates a sense of urgency and helps get readers to act. Multiple promotions: Though I do find this ecommerce email template a tad busy, promoting multiple sales offers means there’s something for everyone. This is particularly good if your email list isn’t segmented, as it presents a “catch-all” for your subscribers. Hopefully, this article has given you a couple new tools to use in your ecommerce email templates. Though not all of the tips here will work for everyone, test a couple of them and see how they do. If you see results or have any questions let me know in the comments below!